DRDO tested the Pinaka Mk-2 Multi Barrel Rocket Launch System (MBRLS) on Thursday, May 29, 2014 at Chandipur-on-sea, near Balasore in Odisha by firing three salvos. "Three rounds of Pinaka rockets were successfully tested from the proof and experimental establishment (PXE) today at Chandipur," a source told PTI. In July 2013, the Pinaka Mk-2 system had undergone successful trials at Chandhan area in Pokhran field firing ranges in western Rajasthan. Development and trials of Pinaka Mk-2 is ongoiing and the advanced unguided rocket system is expected to enter service very soon. 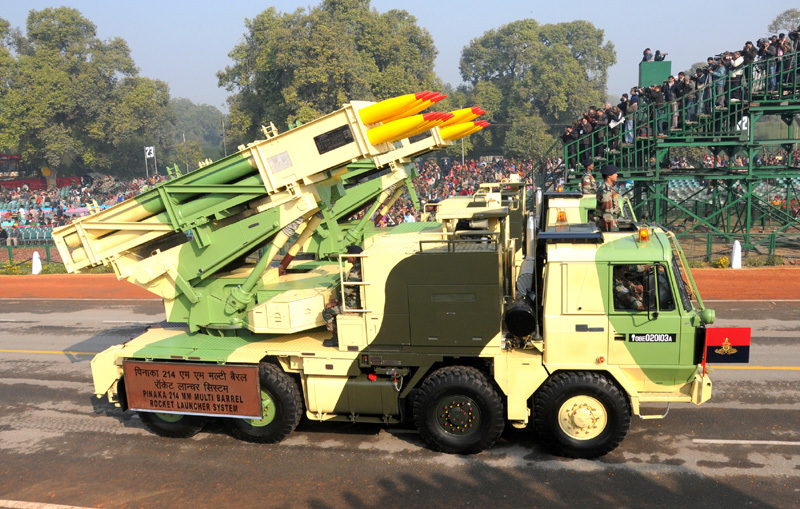 DRDO is developing the Pinaka MK-II rocket, with an extended range of 60 kms, against 40 km for Pinaka Mk-I. In an interview with The Hindu published on August 22, 2013, DRDO Chief Avinash Chander confirmed that his scientists are "enhancing the range of Pinaka rockets from the existing 40 km to 60 km for Pinaka mark II." Previously it was reported that early static validation trials of the rockets are underway and DRDO plans user trials of its warhead. IDP Sentinel members can read more about the Pinaka MBRLS at the link below.